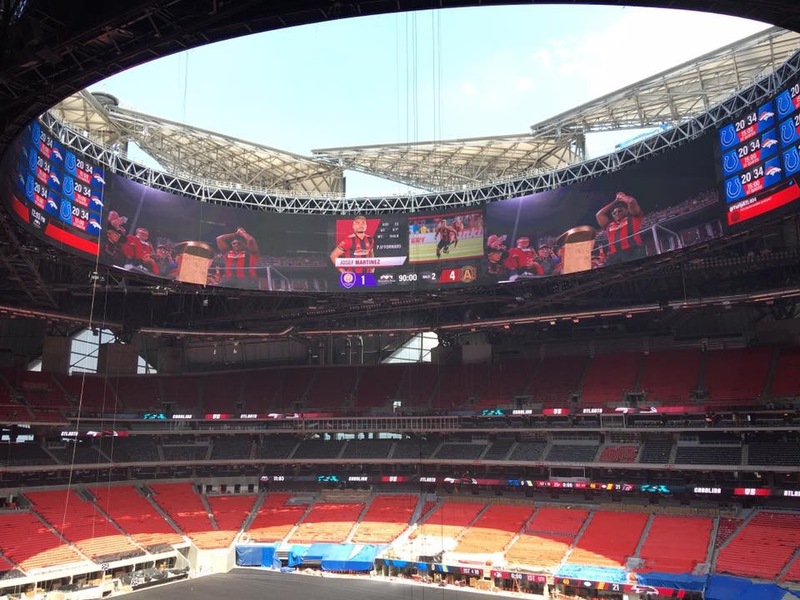 There are videoboards, and then there’s the 360-degree halo that surrounds Mercedes-Benz Stadium, the soon-to-be home of the Atlanta Falcons and Atlanta United FC. As the stadium takes shape around the one-of-a-kind video display, one thing is certain: the phrase “one of a kind” doesn’t even begin to describe what’s currently happening in Georgia’s capital. Measuring 58 ft. high and 1,075 ft. around, the halo provides 61,900 sq. ft. of video real estate. AMB Group, the parent company of the Atlanta Falcons and Atlanta United FC, broke ground on Mercedes-Benz Stadium in 2014 and, by 2015, had released several renderings that showed plans for a nearly 60-ft.-high, 360-degree video display sitting just below the stadium’s retractable roof. Engineered, built, and installed by Daktronics, the video display slowly took shape above the field; today, it measures 58 ft. high and 1,075 ft. around, for a whopping 61,900 sq. ft. of video real estate. It is currently the largest LED video display in North American sports. Although the plan was to create a videoboard that can be seen from wherever a fan sits during the game, the challenge was how to program it. Soto and his Mercedes-Benz Stadium Production team first had to determine how the screen should be segmented, striking a balance between maximizing the display’s potential and overwhelming fans with video and graphics. They decided on quadrants, to best serve the fans sitting on both sidelines and in both end zones. The halo won’t always be segmented into quadrants showing the game in progress; Soto’s team has plans to split the board into as many as 16 segments to show other NFL games via NFL Sunday Ticket, as well as to show full-board, 360-degree video to pump up fans. 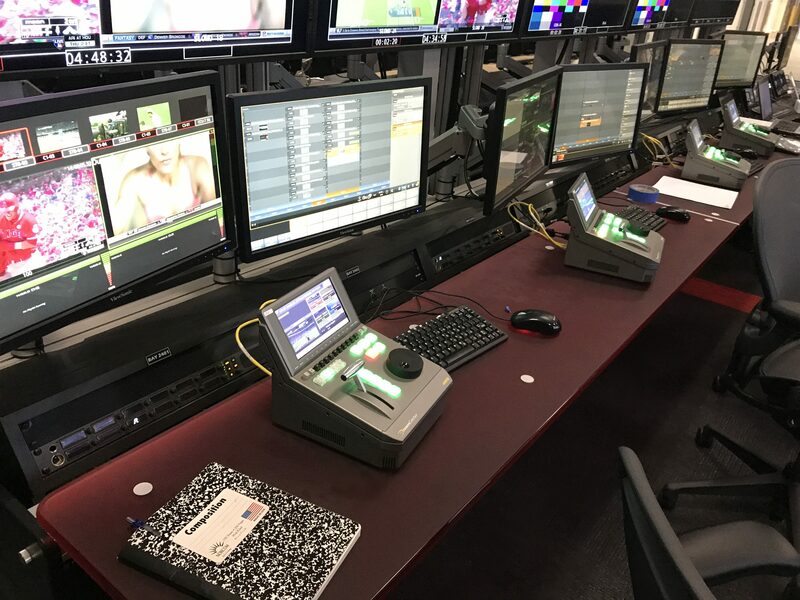 The control room features two Ross Video Acuity production switchers — each with its own director and TD — to handle the primary-follow and reverse-follow game presentation. The team also selected three Ross Video XPression Studio CGs and Tessera software for in-game graphics. At the heart of the 1080p60 video-control room is an Evertz EXE IP router. Evertz DreamCatcher will handle replays, and nine Christie Spyder image processors will handle the amount of video being played out on the halo display. 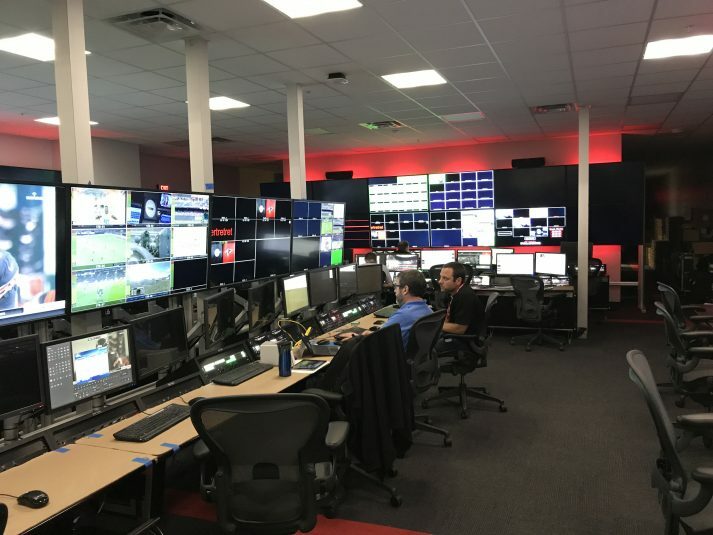 The control room will support all LED video within the stadium; according to Daktronics, the stadium contains more than 82,500 sq. ft. of LED video, including a 101-ft. “mega column” stretching from the first concourse level to the roof. The video-control room features a wealth of gear from Ross Video, Evertz, AJA Video Systems, and more. To capture content, the Falcons purchased 10 Grass Valley LDX-86N cameras, eight wired and two wireless. Of the 10, four will be licensed for 4K, and four will be licensed for 6X slo-mo. The team’s video philosophy, says Soto, will be to show fans that they are a part of the Atlanta Falcons’ brotherhood. Mercedes-Benz Stadium is scheduled to open in time for a Falcons preseason game against the Arizona Cardinals on Aug. 26; previously announced opening dates had been pushed back because of the complexities of the retractable roof. As the stadium undergoes its final touches, Soto and his team continue to find new ways to maximize the halo display’s potential. Thus far, they like what they’re seeing. 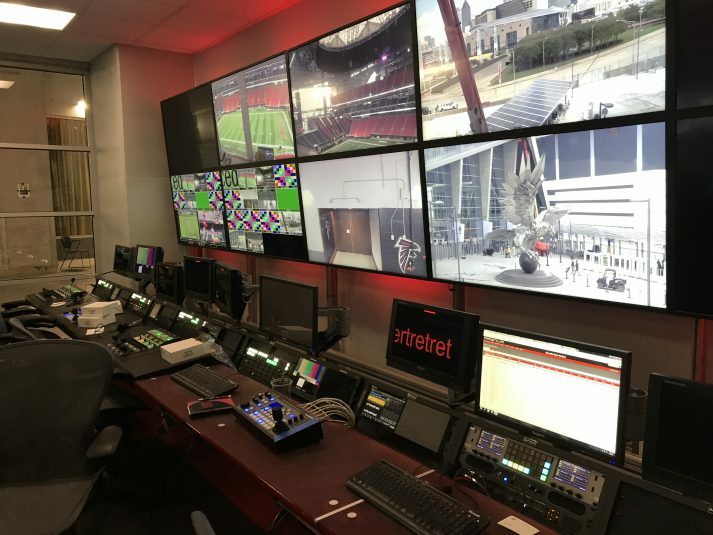 Evertz DreamCatcher will handle all video replays for the Falcons. “We walk around the stadium to get different angles and see how it presents in the upper bowl vs. the lower bowl vs. the sides,” says Soto. “And there are times where I get caught just staring, because it’s captivating. … There are so many things that, I think, for three to four years, people are going to just say, Wow. Every time they come in, there’s going to be something unique [that they] didn’t notice last time. As we evolve, [we’ll start to look at] what else we can do in the 360 environment and what else can we do to tell the story of the Falcons.